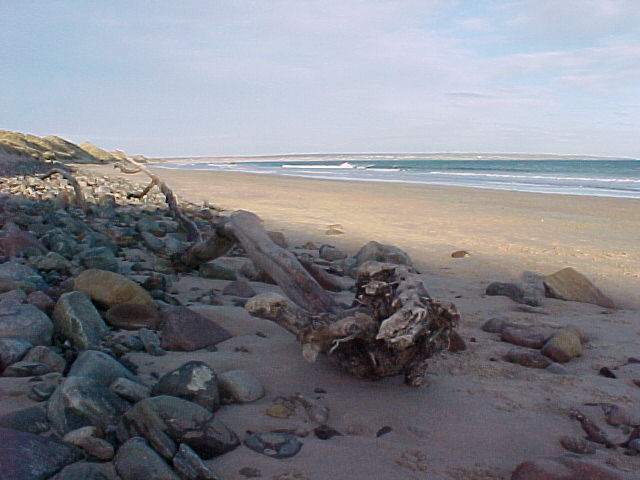 Caithness has a range of beaches that are great for walking on. the hardier elements might try swimming in the cold fresh waters off our coast. Caithness is a small county but has a long coastline. much of it is lined with cliffs but near many harbours and villages are small beaches and coves where the old herring boats used to land. On the north coast there is a particularly fine beach at Dunnet. You will see from the Good Beach guide that the county is not mentioned and that is because the sewage is not monitored. Well there is so little sewage here that who would want to monitor it. Scottish Water is nevertheless building treatment works all round the north and even our small outputs will soon be put through treatment plants to comply with stringent European rules on water and discharges. So our beaches are probably the cleanest of any place in the UK but they are not monitored so cannot be included in lists like The Good Beach Guide. The only controversy in Caithness surrounds the beach at Sandside opposite the nuclear plant at Dounreay. Over the last 20 years ort so about 19 or 20 radio-active particles have been found after extensive monitoring that goes on almost daily. It is still a beautiful beach and if swimming is not what you had in mind then well worth a look. The beach at Dunnet has a backdrop of sand dunes and across the road a small forest. The Highland Rangers also have a centre at this beach where they run various activities and walk through out the summer months. Dunnet used to see sand yachters but they have not been on the go for a number of years. Surfing is popular with competitions every few years. In 2002 there is a suggestion that there will be a week of kite buggying on the sand at Dunnet. The long stretches of open sand are particularly suitable. the beach stretches all the way round to Castletown. There are several rocky beaches and a few with a great many shells such as the one near Harrow Harbour. The beach from John O'Groats To Duncansby Ness also has great quantities of shells from time to time - depending on how the tides have worked to wash them in. Access to the beaches of Sinclairs Bay can be found at several places - Ackergill, Wick Golf Club about two miles out of Wick, or Keiss. Just ask how to get to Reiss Beach and someone will tell you how to get there. A small beach at Murkle Bayis one that you will often have all to yourself. The beach at Thurso is in parts rocky and parts sandy especially the part running round to Scrabster where the yachts are usually out on a Saturday morning. There is a small sandy beach at Freswick where several years ago they dug out a Viking midden. Tale a look through the A - Z and you will find many places with beaches in Caithness. The Bishops Palace site is situated on the beach on the road to Scrabster on the right hand side. Keep an eye out for a recent sculpture called the Vent and the Palace site is nearby.